Did You #GetOutAndGame in 2014? Last year I put the call out to all you fantastic gamer-geeks to grab your card games, board games, and role-playing games, and head out into the world. I believe that one of the best ways to pull more people into the gaming community is to showcase our favorite games out in public. Sure, we do this whenever playing at a friendly local game store, or a gaming club, that's sort of a given. But there are a lot of other places where we can gather and game. As my contribution to #GetOutAndGame last year I wanted to find these locations and and report back to you all. 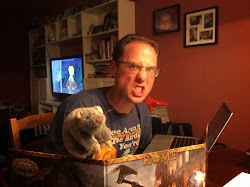 So along with my daughters and a few great friends from the Norwin Game Knights, I explored some unconventional options for role-playing games! As we prepare for the 2015 season of #GetOutAndGame, I'd like to recap our adventures from last Spring and Summer, to show you how much fun you can have gaming abroad! Not once, but TWICE I managed to pull some players together to try Numenera in a public park. Our first game was at White Oak Park, and our second was at Oak Hollow Park, both in the Pittsburgh area. We found that gaming in a park allowed us to combine two great activities: biking, and role-playing! Along with a packed lunch and lots of water, we got some exercise in and then ran Seedship, an adventure from the Numenera core book. The only downside to gaming out in "the wilderness" is the bugs… especially if you have a child that doesn't like bees or hornets! Although we had a few close encounters, we're definitely going to try this again! Did you know that you can pretty much game in any restaurant so long as you ask permission first? Alternatively, you can not ask for permission, and just show up to play! We tried both methods as I ran Numenera: The Beale of Boregal between two sessions: one at Five Guys Burgers and Fries and the other at Panera. We asked the manager at Five Guys if it would be a problem to roll some dice for an hour during a Sunday afternoon, and he gave us the green light! We even scored a healthy extra dose of fries for our game! I'd say the only downside to playing a game at Five Guys is the grease. I'm pretty touchy about keeping my books free of marks and spots. Take a look at that massive pile of fries above… it was next to impossible! Panera was easier on the books, but we took a risk trying to play without asking first. There is a long table at our local Panera, typically used by other groups trying to hold meetings and gatherings. Since it was open, we grabbed the table and started rolling dice after a club meeting. No one came by to stop us, and it actually felled a lot like playing at home… possibly because I spend so much time at Panera! 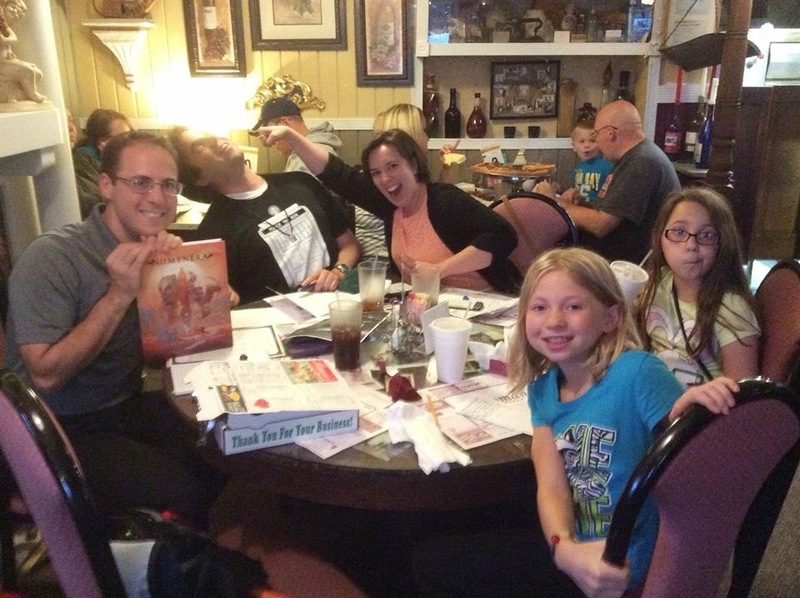 We actually had a third restaurant session… one that was a bit more stressful as a GM! When looking for local restaurants to host our gathering, Romano's in downtown Irwin offered us a table. We happily made reservations for what seemed like their least busy evening, but when we arrived the restaurant was packed… and our table was right in the middle of the dining room! Nervously I ran Sleeping Giants while several other diners watched my crazy group of gamers partake in a roleplaying game. Of all our events, I would say that this one probably exposed the most "non-gamers" to our epic hobby. Who knows, maybe we planted a few seeds? Ever Game at a Ren Fest? 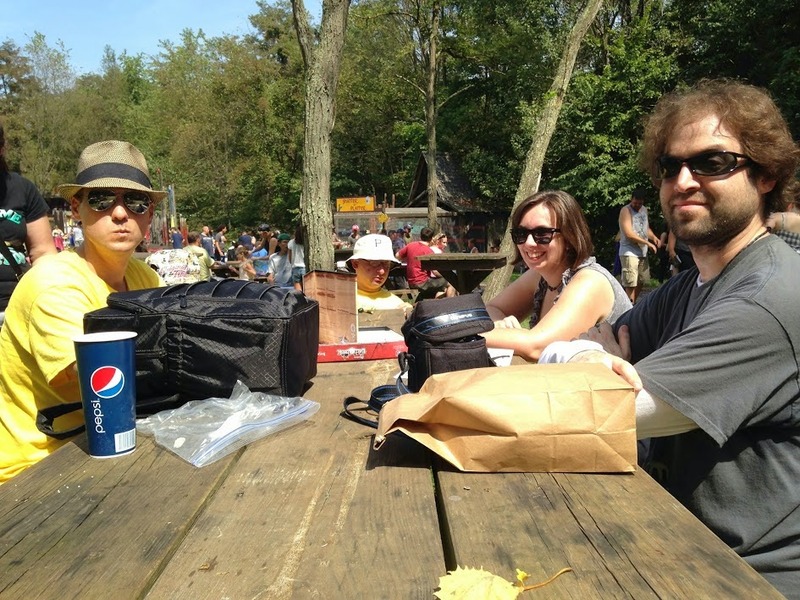 Classic old-school gaming meets the Pittsburgh Renaissance Festival, as we concluded our 2014 #GetOutAndGame season with a little gaming surrounded by leather clad rogues and steaming, smoked turkey-legs. Our choice of OSR titles was "Adventures in the East Mark", which I had just picked up at Gen Con 2014. I still don't know how I talked Andy, Emily, and Jeremy into giving this a try, and to this day wish we had planned better. Since we tried gaming during lunchtime, seating was very limited and we were stuck out in the open on a really, really hot day here in the 'Burgh! Okay gamers, it's a new year and time for a new season of #GetOutAndGame! And this year, I don't want to do this on my own! I promise to pick some new, crazy locations for our group to play, as well as some new and exciting games, but I need you to do something in return: I want you all to try this, at least once, and then report back on your event. Use this as a reason to try that one special game that has been sitting on your shelf for months. What? Your summer is full due to vacationing? Well why not take your adventuring on the road! We'll save that for another post, but get your thinking caps on now! We're already planning to be RPG'ing at Disney World this fall for Disney Con 2015*! *Disney Con 2015 is not an official, sanctioned gaming convention… yet. This past weekend was quiet, with no role-playing games on the schedule. 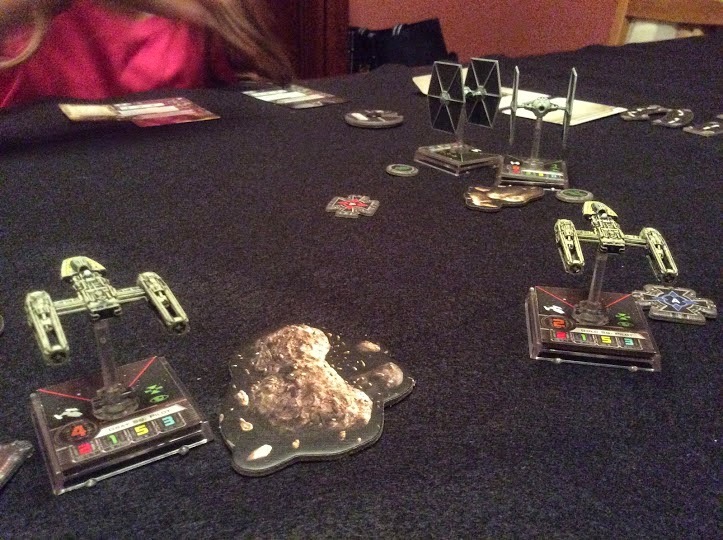 Given my current infatuation with all things "Star Wars", I thought I'd introduce my two daughters to the game. The girls were instrumental in the big "unboxing video" that we did with my wife, so it's only fair that they get a chance to take a few shots at their dad with our new game. Carrie and I played our game on Saturday night, not long after dinner. She had asked to fly the Millennium Falcom, and I happily obliged. On Thursday when I played against Carmel, she was just using the Stock YT-1300. But Carrie not only had the Falcon, she had Han and Chewie ready for action! 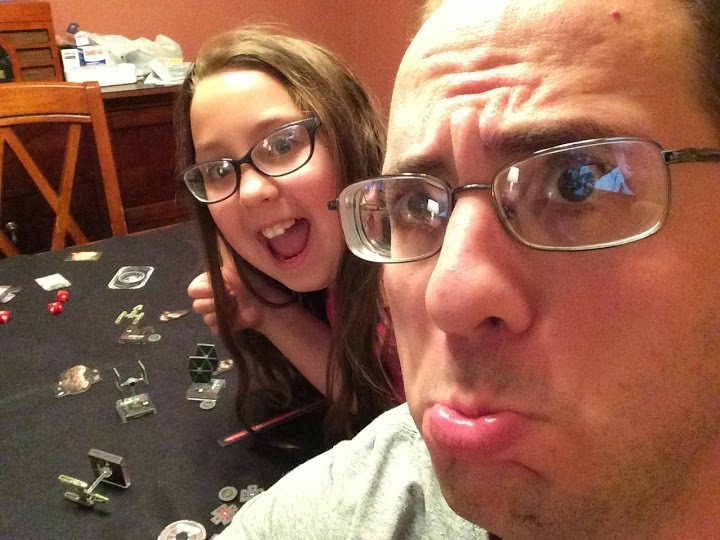 Evie didn't want to play the "good guys" during our Sunday night game. She wanted to be the "Tri-Fliers", because they looked cool and had "shields" on their sides. After correcting the name of the TIE Fighters, I asked if she wanted still wanted to play for the Empire. Evie told me that since I play TIE Fighters, she wants to try them out. 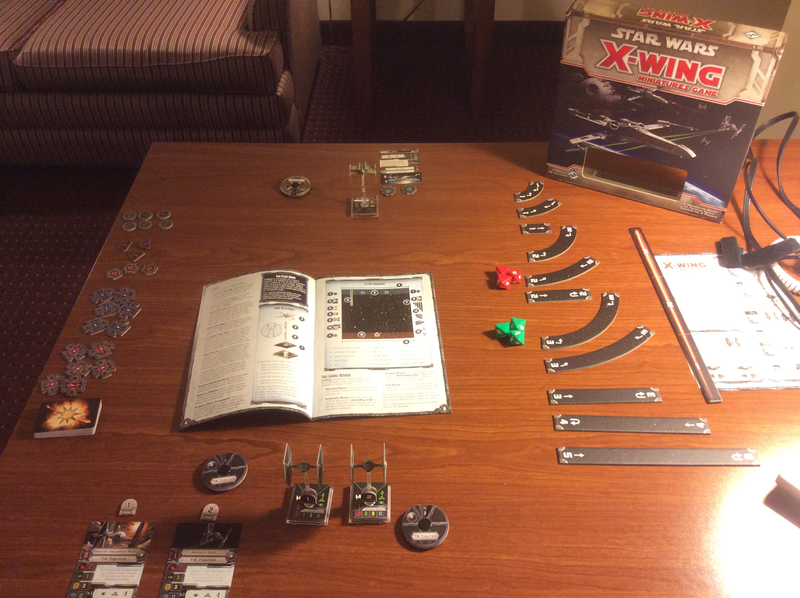 At the suggestion of my friend and fellow blogger +Marc Plourde (you can find his blog here), I did these two flight reports with turn-by-turn pictures of the board. For my flight with Carrie I did the pictures from above the board. Our game with Evie featured pictures from a more cinematic perspective. If you have a preference of one over the other, please let me know! 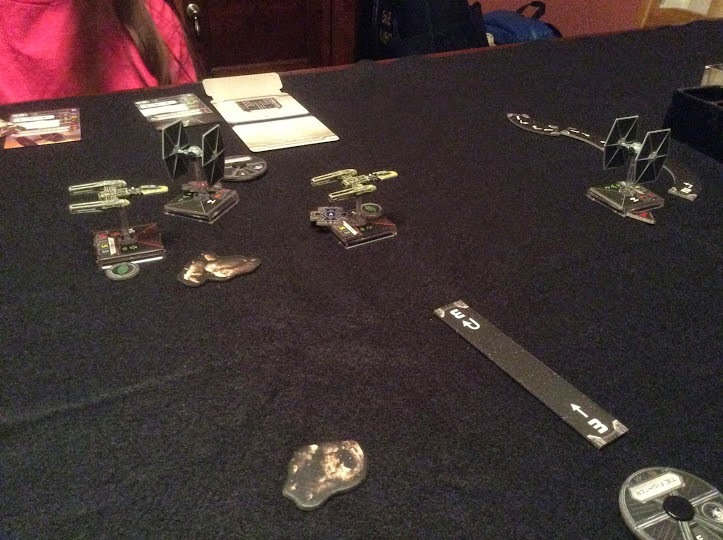 YT-1300 Freighter vs. 3 TIE Fighters. Have you seen the video of Han Solo dancing in Star Wars Kinect? The picture above is of Carrie doing one of the dance moves after she shot down her first TIE Fighter with Han, Chewie, and the Millennium Falcon. Even though the two sides matched up evenly in terms of points, I was concerned that my trio of TIE's would overwhelm Carrie's single freighter. In my previous game with Carmel, the battle was very one-sided. But even with a few hiccups from the movement system, and with minimal help from her dad, Carrie managed to pull together a rather impressive showing! 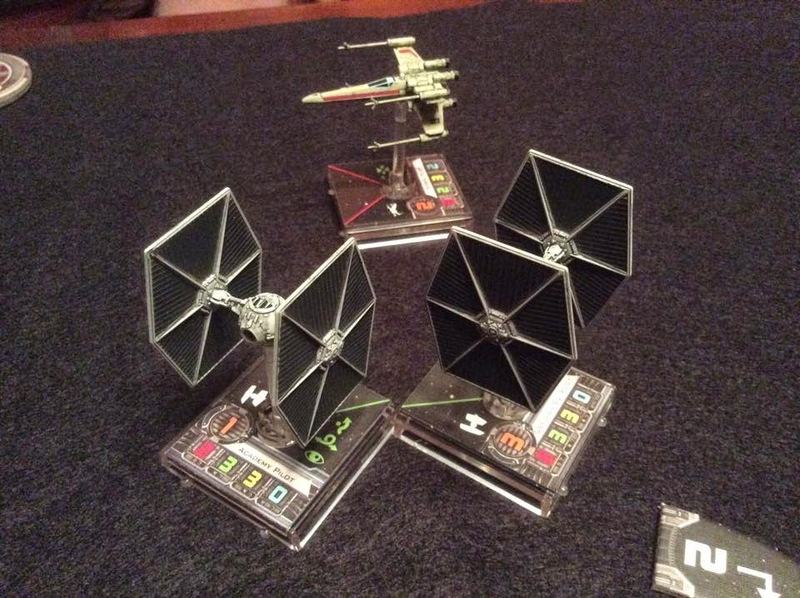 3 TIE's in formation against 1 YT-1300. I tried to keep the TIE's together in formation. I sprung the attack, and the TIE's started whittling away at the shields. The Falcon couldn't land a shot. 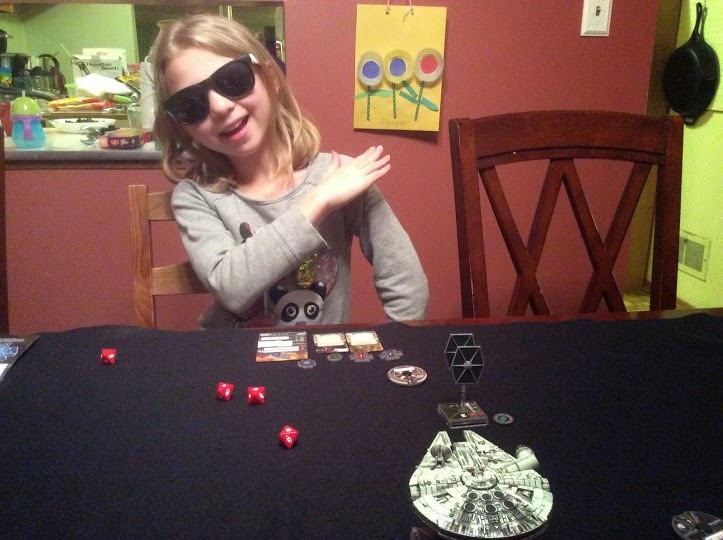 Carrie started driving the Falcon off the board. 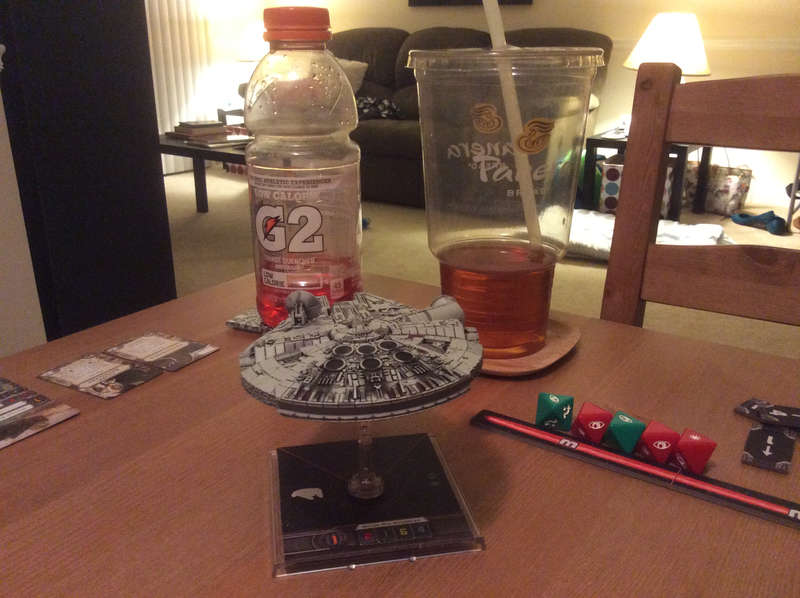 Carrie turned the Falcon around, taking on stress, and losing shields to the TIE's. I got cocky and started pressing the attack. 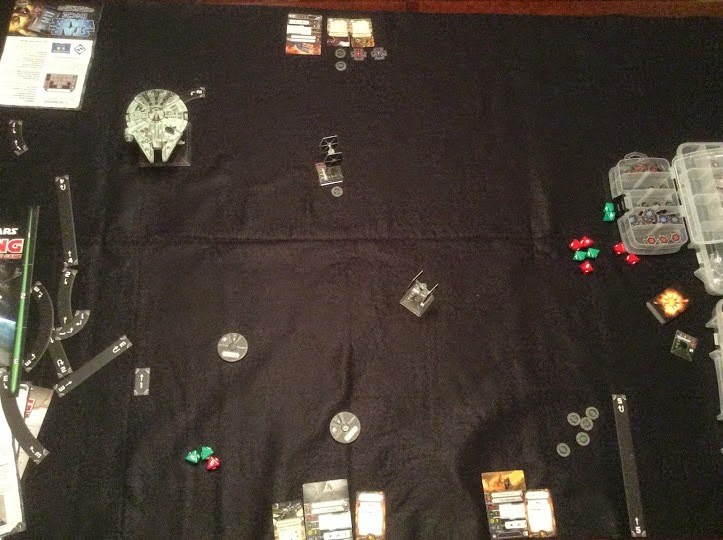 Here's where I made the mistake: I split my TIE Fighters. 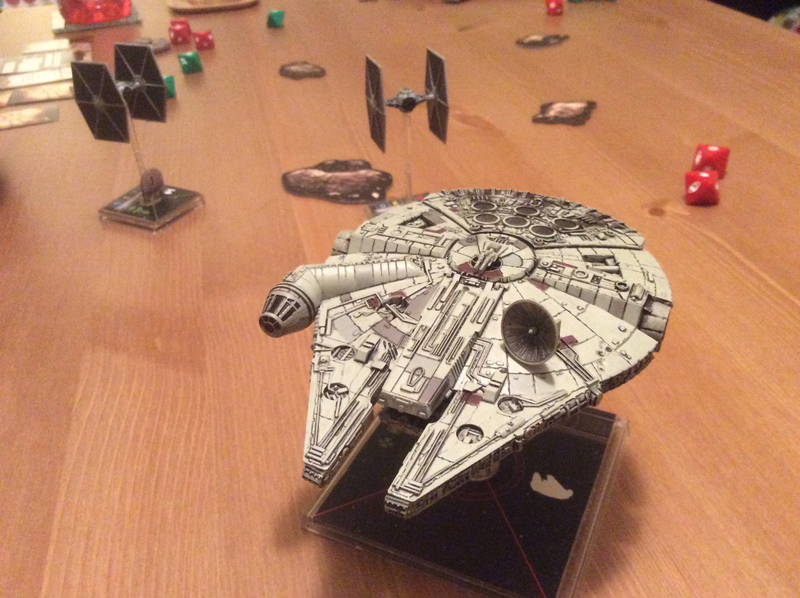 The Falcon caught a TIE in a turn, blasted it into pieces! 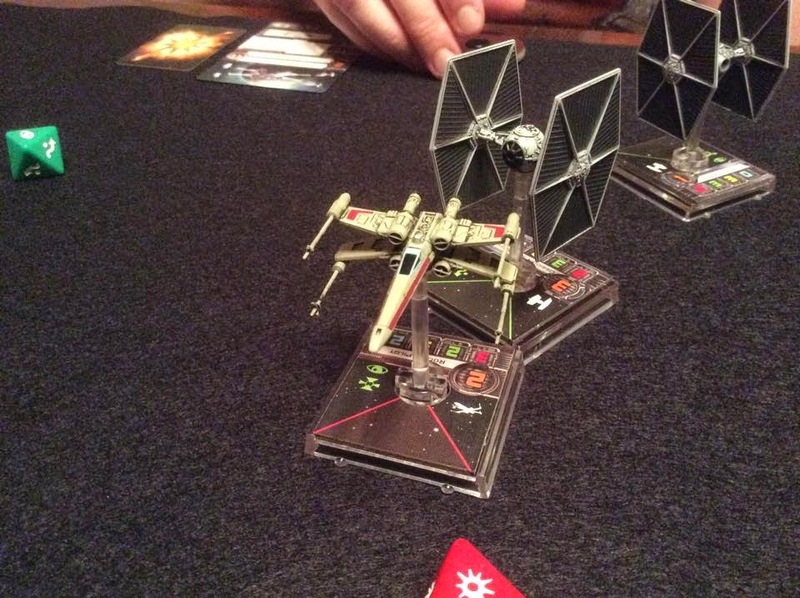 Carrie continued to fire the quad-lasers at the TIE's… dang turret! TIE's still couldn't land a hit. The gunners on the Falcon aimed again carefully, knocked out another TIE. The last TIE fled the scene! 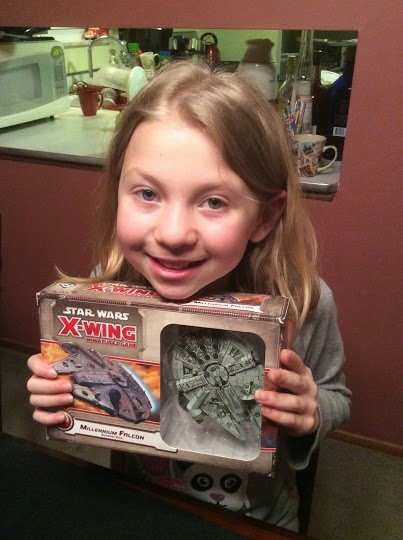 Carrie and her favorite Star Wars ship! 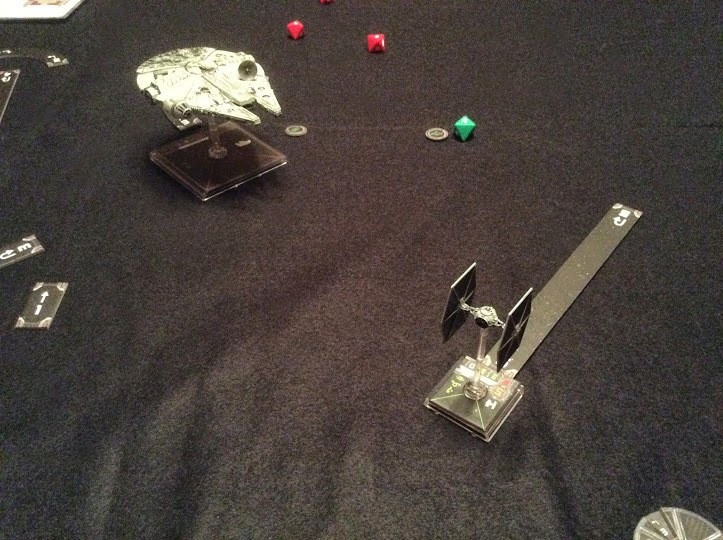 2 Y-Wings vs. 2 TIE Fighters in an asteroid belt. 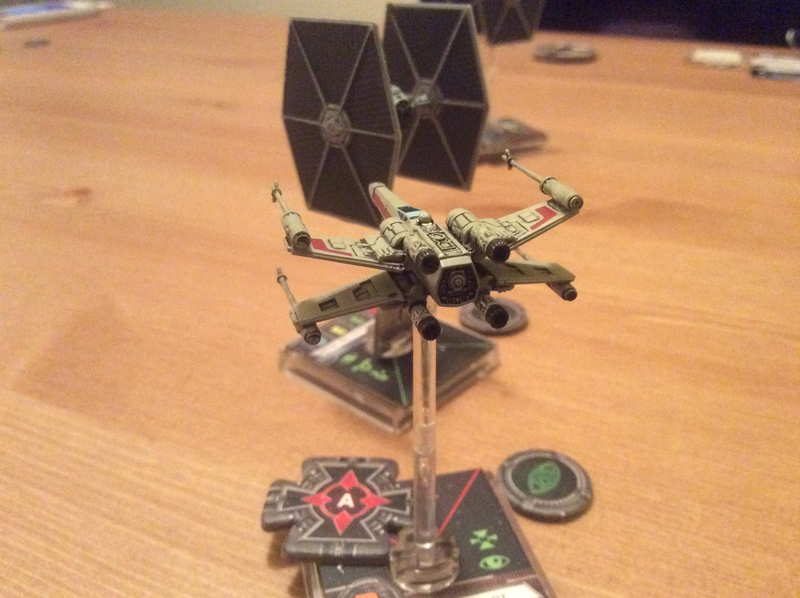 First game with the Y-Wings. I walked into this battle knowing that my chances were slim-to-none of pulling away with a victory. 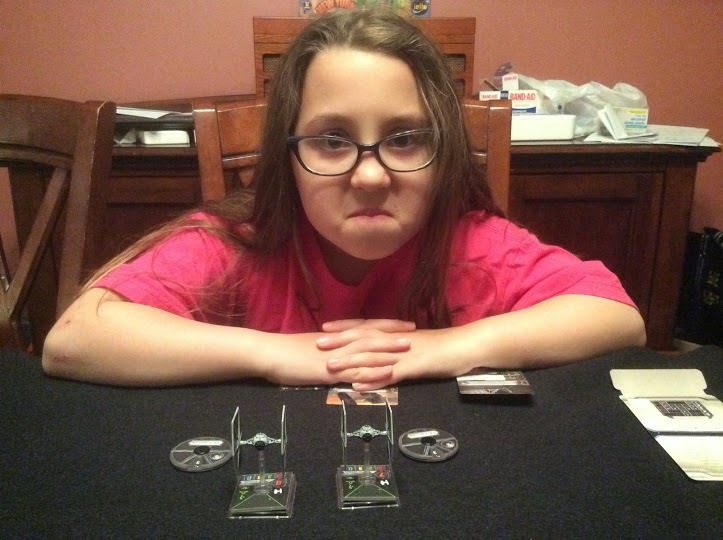 Just goes to show, that a pair of poorly equipped Y-Wings is no match for even an 8-year old first time player with two TIE Fighters. Not only did Evie have TIE's, she had Howlrunner and Mauler Mithel, a devastating team! 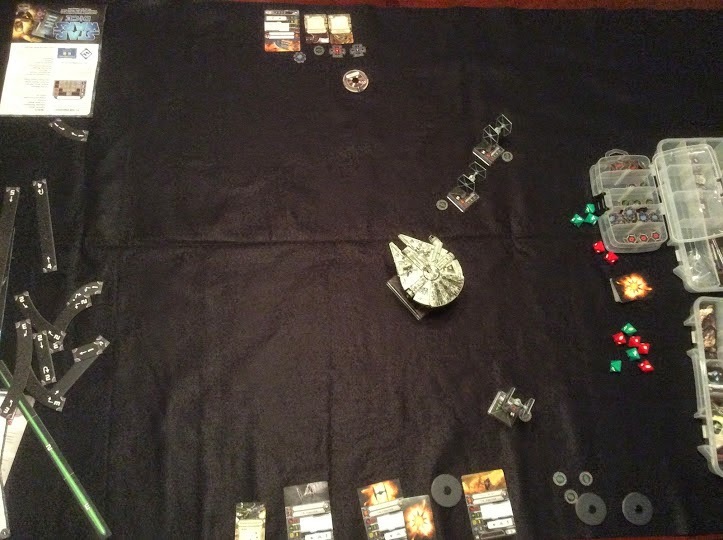 Since it was already after bedtime, our deal was that we would play until the first fighter was shot down. Evie was fine with the arrangement, and after placing some "potatoes" (that's what Carmel called the asteroids, and we stole the name), we took flight! I chose to move forward cautiously, while Evie's TIE's banked left. Evie didn't quite have the hang of maneuvering. On her second turn she accidentally shot off in the wrong direction. Mauler had to turn all the way around, but Howlrunner was on top of a Y-Wing. 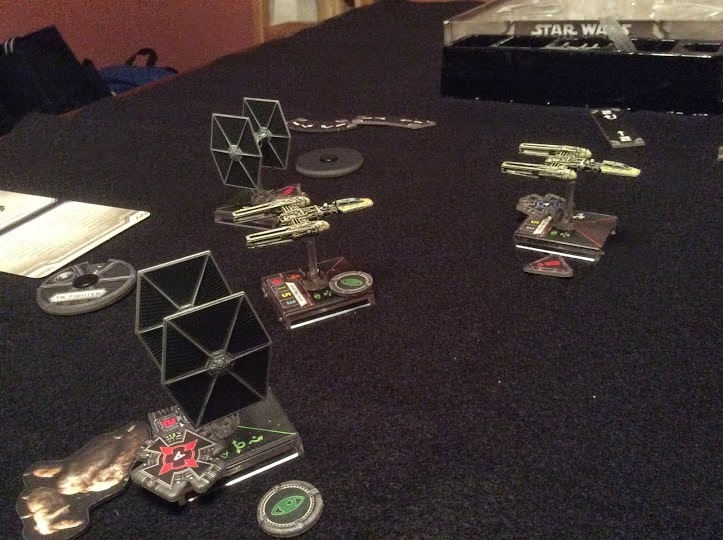 The Y-Wings, tried to turn away from the TIE's. 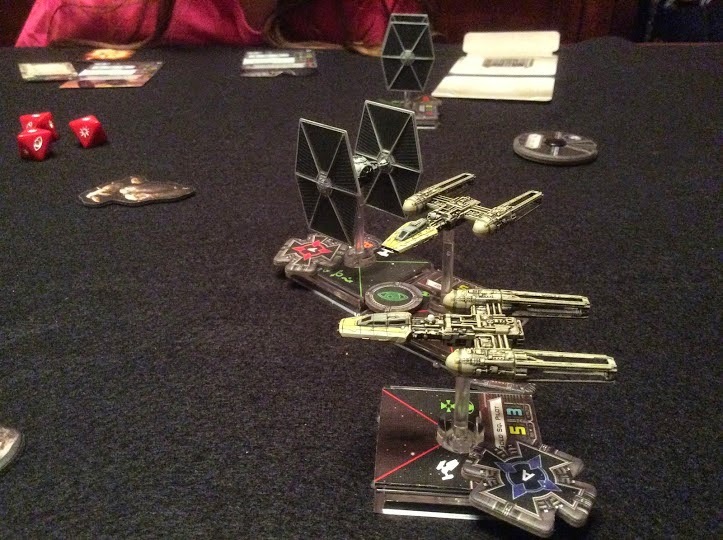 One TIE split off, but the other (Howlrunner) remained on the attack. Howlrunner broke off while Mauler dove in. 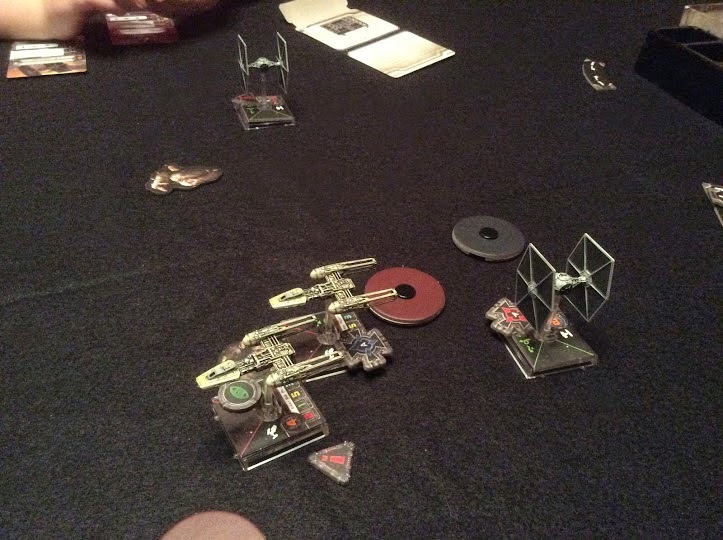 Mauler Mithel pressed the attack, continuing to hammer the Y-Wing. One Y-Wing fled as the other broke apart in space. This week I found myself in Virginia for training and meetings. Since my regional office is in Alexandria, I make it down here at least once a year, but never dread the trip since my extremely awesome cousin Rachel and her amazing fiancé Carmel (both made famous during our games of The Strange) live just a couple miles away from the office. Rachel was unfortunately on night shift this week, but Carmel had nothing else going on and is a Star Wars fan! Since I'm learning the Star Wars X-Wing Miniatures Game, I traveled with my starter set and Millennium Falcon miniature. 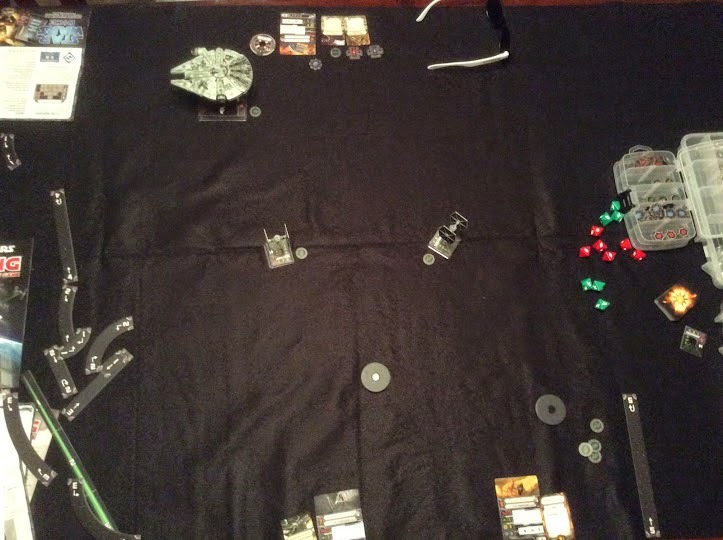 Lone X-Wing vs. 2 TIE Fighters on an open table. First attempt with the full rules, with a handful of bumbles, stumbles, and trips. Okay, playing Star Wars X-Wing versus yourself is a little difficult. 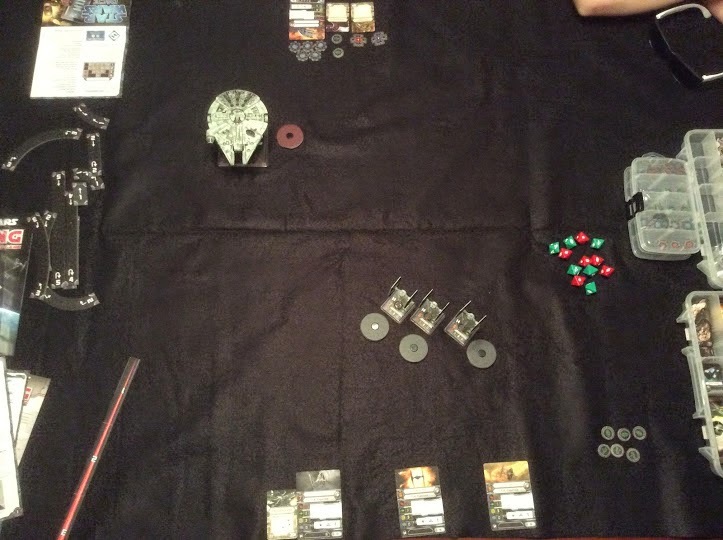 Trying to play both sides from a balanced perspective is challenging, especially when the turn order is "TIE, X-Wing, TIE". But the point of the game was just to learn the rules, so that's what I did. Since I don't often win these types of strategy games, I was really excited to end this skirmish as a victor! 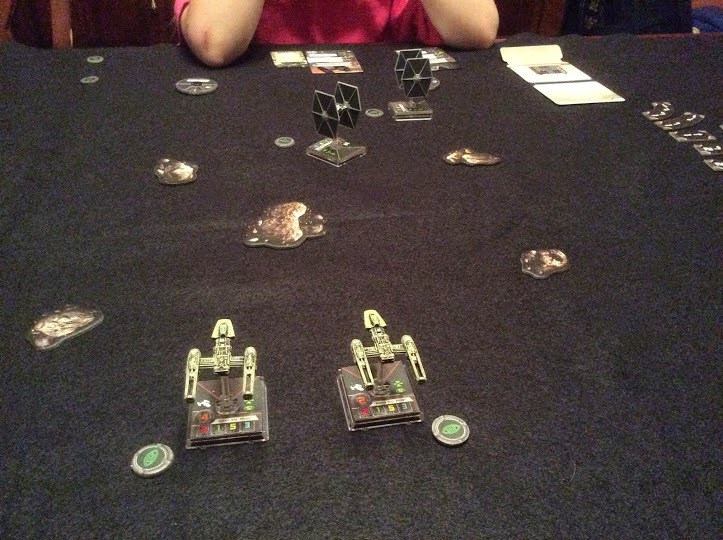 Lone X-Wing vs. 2 TIE Fighters on an open table. Second game with full rules, but this time with another player. Facing off against Carmel was awesome! 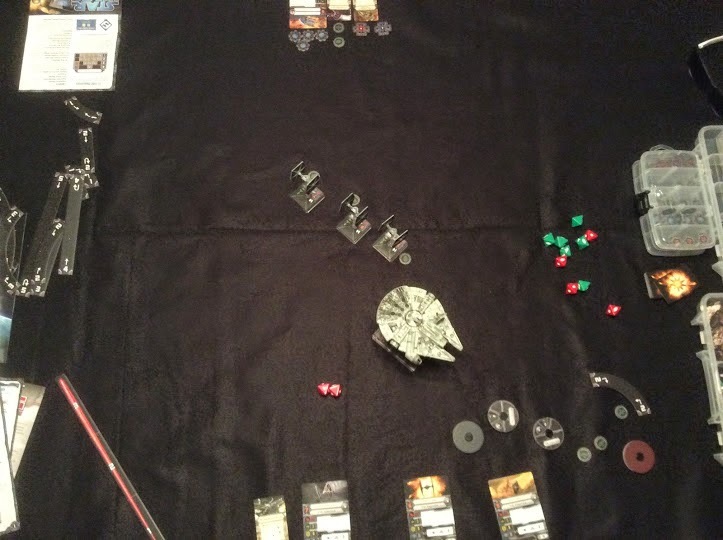 We both started off flying straight at each other, and then I made the mistake of splitting my TIE Fighters, sending one off to the right and the other far to the left. I was able to shoot Carmel's Rookie Pilot constantly, and had some great lucky rolls, but that damned R2-D2 unit kept refreshing her shields! Without that upgrade, I would've won in about fifteen minutes, but instead Carmel methodically took my TIE's apart one at a time. 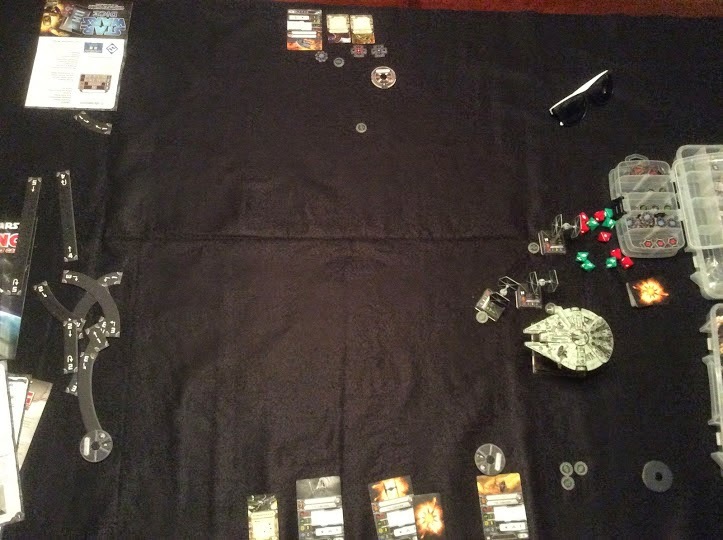 Towards the end of the game we reached a point where I couldn't get past the Rookie Pilot's shields, and due to my Evade ability, and three agility dice, Carmel couldn't knock out my Obsidian Pilot. So I made a comment suggesting that we declare the game a draw and shake hands after just two more turns. Carmel agreed and then destroyed my TIE on the next turn. 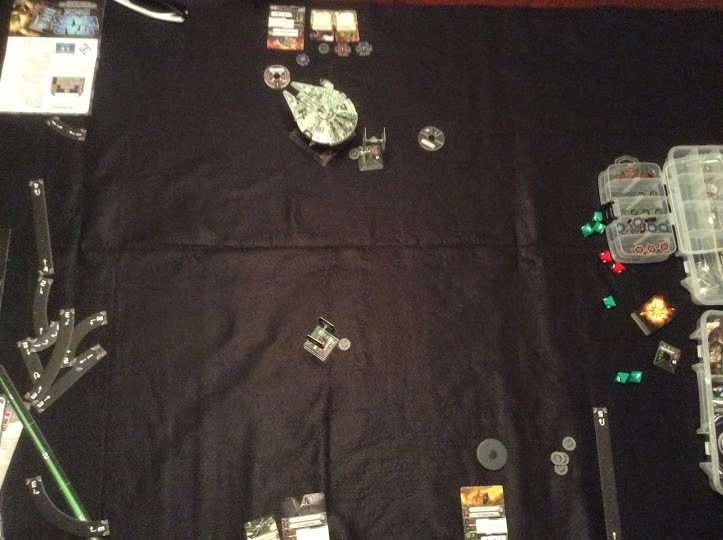 YT-1300 Freighter vs. 2 TIE Fighters in an asteroid belt. 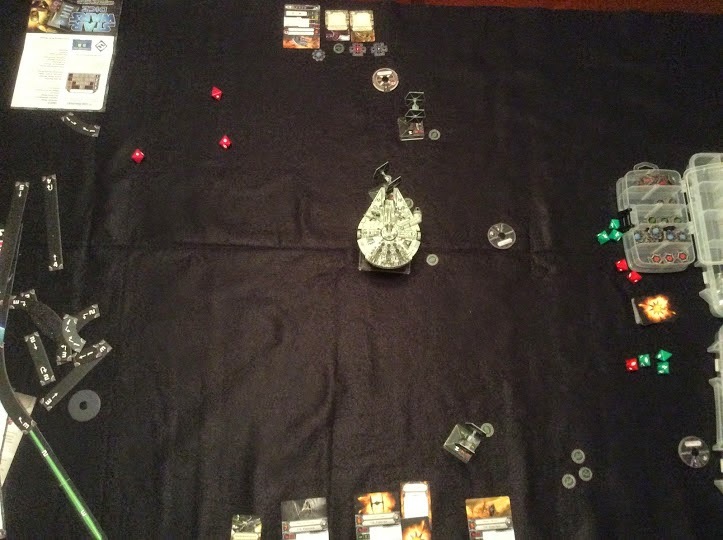 First game with the Millennium Falcon miniature! I was really excited for this game! I fell in love with the Millennium Falcon miniature when I first saw it on the Barnes and Noble shelf over a year ago. I hummed the Star Wars theme while unboxing the figure, and Carmel read the additional rules while I punched the cardboard game pieces. 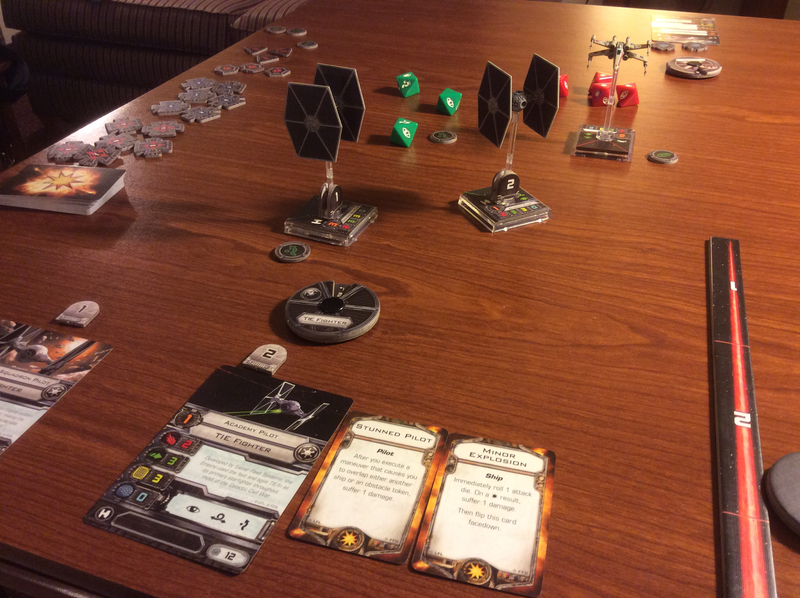 For this battle, Carmel agreed to play a basic Outer Rim Smuggler with some upgrades while I brought two seasoned TIE Fighter veterans to the table. 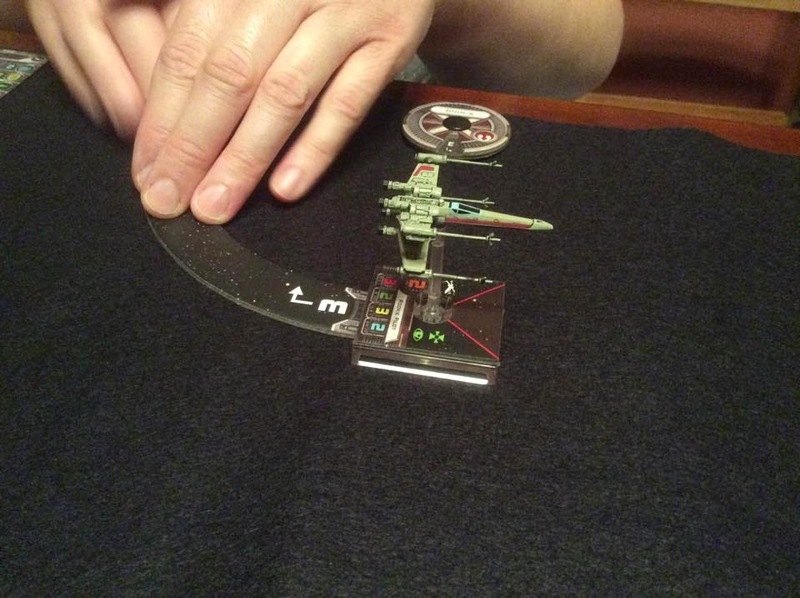 After three games with basic TIE pilots, it was awesome having Mauler Mithel and Dark Curse on the board! To make things even more complicated (and possibly set the balance against Carmel) I threw a bunch of potatoes ... er ... I mean asteroids on the table. This dogfight was rather one-sided. Carmel's Outer Rim Smuggler had to contend with my two "gnats" as well as the asteroids, and space was restricted on Carmel and Rachel's small Ikea table. No judgement, I own the same table, although it serves as a computer desk. 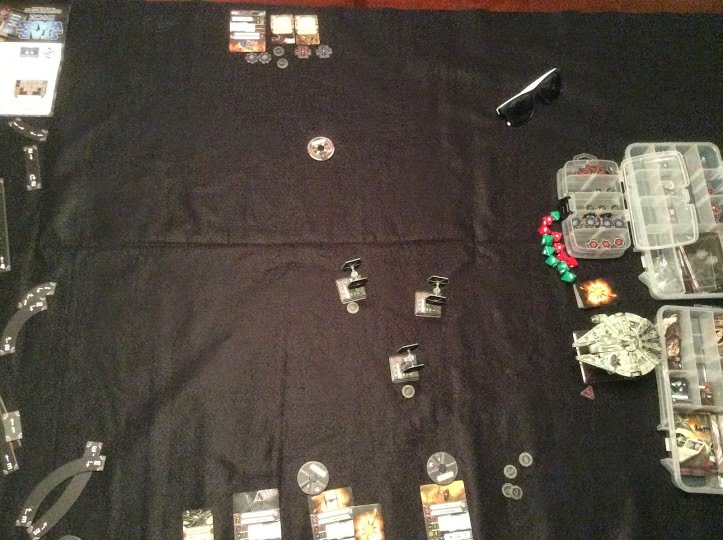 With only two attack dice, and my pilots taking advantage of the Evade action, Carmel couldn't take down either of my TIE's. I changed tactics for this game as well. Rather than split my fighters, I kept them in formation for most of the game, so that they could shoot together on most turns. After chasing Carmel's Outer Rim Smuggler all around the table, almost forcing her to crash into a Gatorade and Panera Iced Tea, I was able to land a stream of critical hits. Too bad Luke and Chewie weren't flying with Han. Two weeks ago I compiled a full list of starting Stormtrooper occupations so that Dungeon Crawl Classics Judges could run a funnel in a galaxy far, far away. I was thrilled with the feedback I received, and we ended up with some inspirational selections, from Desert Comber to Rancor Gongtender. 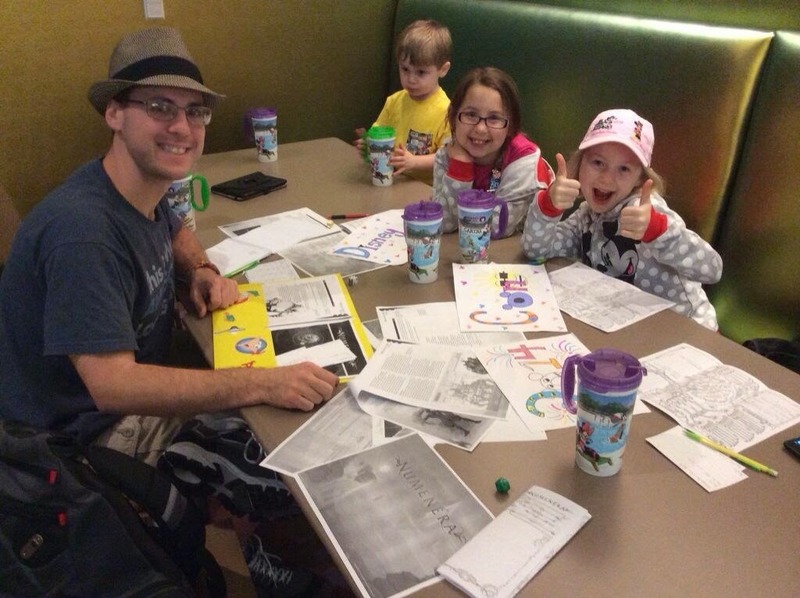 The list was ready just in time for International Tabletop Day, and I ran a quick session for all of the younger RPG'ers in our club, ages seven and up. While enjoyable, I really wanted to try the "Tatooine Funnel" I wrote with some grown-ups. The opportunity came quickly. I wasn't prepared for this week's Tuesday night Numenera game, and I sent the invite for some Star Wars/Dungeon Crawl Classics awesomeness. Not only was the concept new for the five players at my virtual table last night, but for two of them it was their first DCC funnel! 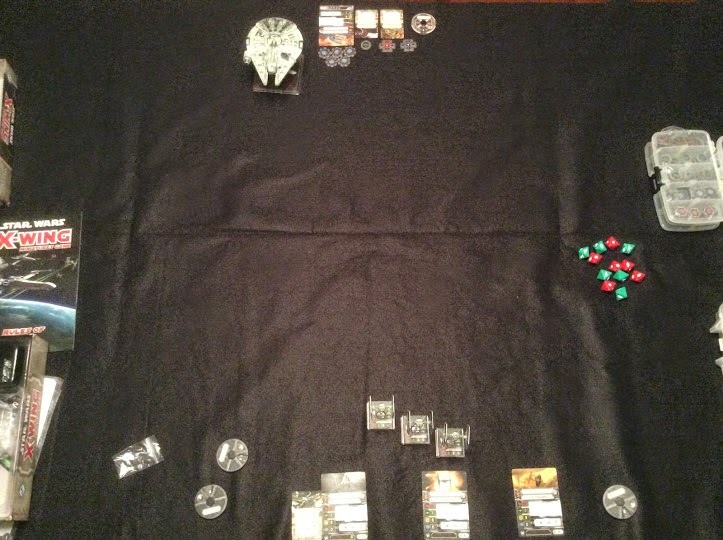 To better keep track of each player's characters, as well as their status (dead or alive), I wrote out five separate cards, and placed three Wizards of the Coast Star Wars miniatures next to their corresponding names. Above the cards I placed a twenty-sided die to represent initiative. Although we didn't have any rolls above twenty-one, my plan was to place a four-sided die next to the twenty-sider if anyone had an exceptional result. That's a lot of Stormtroopers! When you joined the Empire you were nobodies: Order 66 Dodgers, Nerf Herders, Rancor Gongtenders, and other private sector failures. The hipster rebel scum said you would never amount to anything in your life, and that the Force was most certainly NOT with you. You wanted to prove yourselves, to be a part of something greater. You wanted to show the Galaxy that you had the drive, determination, moxie, and luck necessary to bring all of known space to its knees for the greater glory of the New Order. Now, on the hot desert world of Tatooine, you face your inaugural mission - a terrifying manhunt through the abandoned Boonta Eve Classic Podrace track for a forgotten Jedi. Perils abound, and most of you will die. Six months before the Battle of Yavin would've taken place, a squad of fifteen Stormtroopers, led by seasoned Trooper Commander Sten Sterno, was on the hunt for a rogue Jedi. A standard protocol was in place for whenever rumors of Jedi surfaced during those dark times. The Stormtroopers would go in first, and if none of them returned to report their findings, Darth Vader would investigate. This particular investigation took place on the desert planet Tatooine, specifically around the old and forgotten Boonta Eve Classic Podrace course. As the Lambda Shuttle de-orbited and began to scan the area around the racetrack, the vessel was rocked by a stream of ion bolts and blaster fire. Someone from the mesa below was sniping the shuttle, and before the pilot could react, the windshield exploded, and the crew were dead. Turning in bewilderment, Trooper Commander Sten Sterno, was about to take command of the situation when one of the blaster cannon bolts removed his head. With the shuttle spiraling out of control, Fred and Dazz unbuckled their seat belts and crawled towards the front of the craft, in the hopes of regaining control. Fred made it to the pilot's seat first, and pushed the charred remains of the previous occupant aside. As a Power Converter Delivery Agent, Fred had piloted land speeders before, but never an Imperial Shuttle. So it is completely understandable that he mistook the ejection lever for the flight yoke. The rest of the squad watched as Fred (and his chair) were launched up and out of the ship, and Fred waved as he passed the shuttle. Unfortunately the seat's parachute system was damaged by blaster fire, and Fred's descent was less than enjoyable. Dazz had better luck than his comrade. The Mouse Droid Programmer knew how to reengage the autopilot system. Although the shuttle was severely damaged, the onboard system was capable of landing the craft in one of three places: Beggar's Canyon, an open Desert Plain, or a perilous field of massive, arched stones. Dazz selected Beggar's Canyon, and the shuttle slowly descended. But when the craft settled just above the eight-hundred foot deep canyon, the weight of the shuttle caused a slight avalanche of stone, sand, and Imperial property. The shuttle violently fell down the canyon, until it got stuck sideways only two-hundred feet from the bottom. … and was then quickly devoured by a pack of Womp Rats! Quickly the stormtroopers flooded the side-ways cockpit and started to shoot their blaster rifles at the Womp Rats below. Some of the troopers, like Lazlo, were careful to take hold of an open seat while firing, while others, like Hau, used electrical tape to wrap themselves to the side of the vessel. But not everyone was so lucky. Onna Cavi tried shooting her rifle with two hands, forgetting to hold onto something stable. The screams of her two-hundred foot fall echoed throughout the canyon. Preesh Vas wasn't about to stay up in the shuttle. The Dewback Breeder had experience dealing with Womp Rats, so he grabbed his rifle and Dewback Prod, and climbed down to the bottom of the zipline, fighting back against the rodents in a hand-to-hand struggle while his team attempted to lay suppressive fire. During the battle, Dazz found something interesting: the plans for a power converter system that Fred left behind in the cockpit. Dazz was pretty sure he could create some kind of explosive device if only he could grab one of the power converters from the shuttle. While the rest of the stormtrooper squad descended the zipline, finishing off the Womp Rats, Dazz went last. But as the Mouse Droid Programmer started to climb down, the shuttle began to shift. Dazz tried running out from under the falling vessel, but was crushed. At the end of the encounter, Wreckless was feeling pretty good. He had survived the battle, despite having to hang by one arm from the cockpit while firing. Unfortunately, the Villainous Scum had a bloodclot in his arm, and after pondering the mysteries of the Dark Side, the bloodclot went to his heart and he died unexpectedly. Since he had taken the initiative to battle the Womp Rats in a hand-to-hand struggle, Preesh Vas was elected the new leader of the Stormtrooper Squad. He decided to travel east, into the rocky barrens, and then scale the mesa and hunt down the rebel scum that had shot down the Lambda Shuttle. Along the way out of the canyon, however, Saan Dyy noticed a broken but salvageable pod racer on the side of the path. Sollid Mann, an Imperial Plumber, had absolutely no experience working on pod racers, but he seemed pretty sure that he could repair the craft. Using a plunger, mop, and some pieces of a mop bucket, Sollid got the broken turbine working again. Taking a seat in the now-revived pod racer, Sollid grabbed the controls and cheered with great exuberance. Preesh continued to lead the team out into the barrens. Since no one had a pair of binoculars or any other kind of viewing device, the stormtroopers had to rely on squinting to scan the massive mesa. There was a clear path up the side of the mountain, but at the base was a large bantha, an open fire pit, and some tents. "I got this," Preesh Vas announced. "I speak Tuskan Raider." Preesh Vas believed that sand people didn't like stormtroopers, so he quickly removed his armor, setting it aside. The half-naked Dewback Breeder (he was dressed only in Imperial Underpants) approached the camp, and started speaking to the Tuskan Raider chief. Apparently they struck some kind of accord, and Preesh was taken into one of the tents. A half hour later he emerged, dressed in sand people robes, with a noticeable frown. As Preesh returned to his squad, there was a somewhat feminine looking Tuskan that was waving "goodbye". Preesh Vas "bought" the Imperials passage by agreeing to marry the chief's daughter. It was a short ceremony, and none of the other Stormtroopers were invited. Later it would be said that some of Preesh's associates found this rude. The sand people did not seem brave enough to help the Stormtroopers in their hunt for the Jedi but did state that a robed man named "Ben" happened to be near the top. To aid his new son-in-law, the Tuskan chief gave the team three slug-throwers - weapons that could not be deflected by lightsaber. Carefully the stormtroopers ascended to the top of the mesa, where they found a well camouflaged heavy blaster cannon near the edge of the cliff. Upon closer inspection, a short Jawa was near the weapon. Was this the creature that shot down the Lambda Shuttle? "What are you doing here?" asked a voice that came from out of nowhere. A robed figure appeared in front of Preesh Vas. The man ordered the Dewback Breeder to leave and take his Stormtroopers with him, but Preesh was the only one to follow orders. That's when Ned shot first. A hail of blaster and slug thrower fire peppered the ground surrounding the Jedi, as well as the heavy blaster. While the Jedi prepared for combat, the jawa joined the fray, taking a seat behind the cannon controls. A personal deflector shield protected the jawa, but a few shots were making it through the device's screen. The slug throwers were certainly helpful during the combat. Although Sollid Mann managed to break his, Frax and Lazlo landed brutal strikes through the Jedi's robes. Saan Dyy grabbed some janitorial supplies the party was carrying around and created a molotov cocktail for later. It wasn't all sport for the Stormtroopers, however. Squill-The-Nuut and Ned were both cut down by the Jedi's Lightsaber, and a deflected blaster bolt murdered Sollid Mann. The battle turned in the party's favor after a lucky shot from Ted blew the blaster cannon to pieces. The Jedi began to flee, chased by Saan and a flaming bucket of janitorial supplies. The fiery liquid struck near the Jedi, causing him to drop his lightsaber. Despite attempting to turn the weak-willed Stormtroopers against each other in the end, without his lightsaber the great Obi-Wan Kenobi was doomed. The veteran of the Clone Wars was struck down by a Tuskan slug thrower bolt, fired by Frax, an Aldaraanian Travel Agent. Earlier in the afternoon, the stormtrooper had used D'erp's one-way radio to contact Jabba the Hutt for assistance. Although the great gangster was nowhere to be found during the battle, his sail barge did show up to give the stormtroopers a lift back to Mos Espa. "Desert plain is bad! Beggars Canyon looks like a good spot." - Alex made the right call… the party would've faced a sand worm! "You get the crash landing merit badge!" - Rhys Panic started handing out "awards" early in the evening. "If we decide to have a picnic, we're all set!" - Marc teased Frank, who generated his characters with Purple Sorcerer's 0-level generator. Frank left the medieval fantasy equipment on his sheets. "I don't want to talk about it…" - Preesh Vas after completing his marriage ceremony to a Tuskan Raider woman. "We just destroyed our childhoods!" - Andy lamented, as the party killed Obi-Wan Kenobi just six months before Star Wars - Episode IV. If you are interested in another perspective of last night's game, +Marc Plourde, the amazing Blogger over at Inspiration Strikes, wrote a terrific blog-post about the experience! Finally, if you've had a chance to incorporate fantasy RPG materials into your Star Wars games, or Star Wars books in your fantasy campaigns, we'd love to hear more! Please share your stories! As you may already know, Thursday's release of the Star Wars: Episode VII trailer caused me to get a little crazy on Amazon.com. I picked out a select few (or more) ships for the Star Wars X-Wing Miniatures Game, completed my order, and by Saturday there was this enormous box sitting outside my house. To have a bit of fun with this experience, I didn't tell my wife Jen what I had purchased, and instead insisted that she take part in a sick and twisted unboxing video. 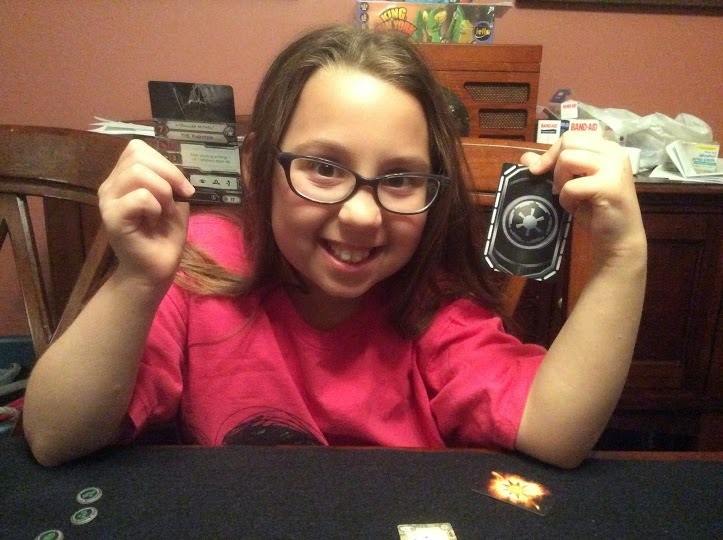 She knew that I had purchased the X-Wing starter set, but had no idea that I was going to release the full power of the "dark side" on our family. … that's right… I purchased all this plastic goodness before having played the game. But I did watch the Tabletop episode about a dozen times! 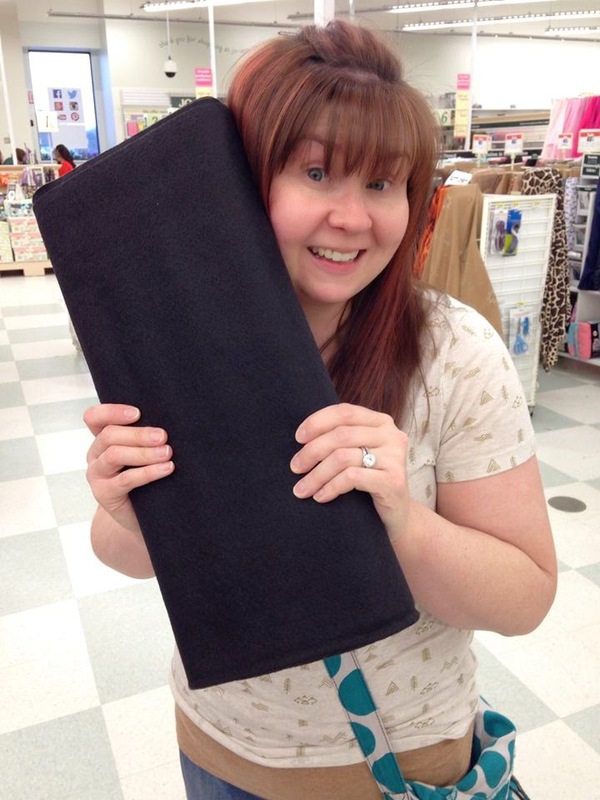 We waited until the kiddos were in bed, and then went to grab the big sheet of felt that Jen helped me pick out from Joann Fabrics Saturday. Sure it wasn't as shiny or interesting as one of the official play-mats, but we figured it would suit our purposes! 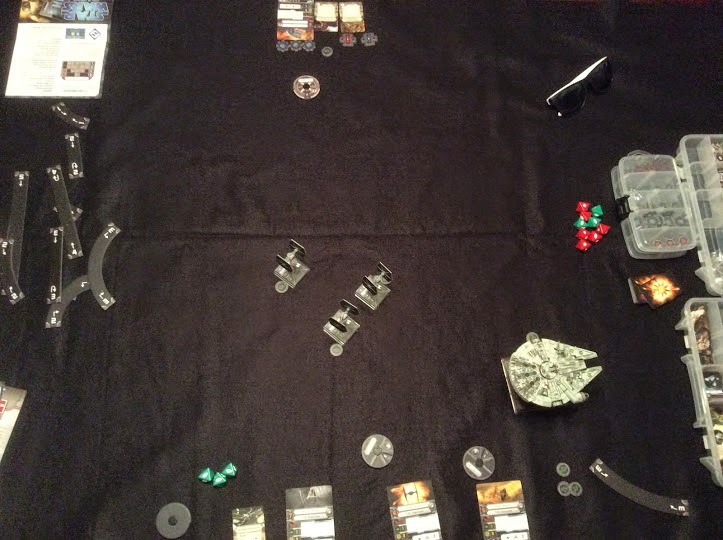 I wasn't sure if Jen would agree to playing last night, so I made her a deal: if she were to play Star Wars X-Wing with me I would watch The Fault in Our Stars with her. Thankfully (for both of us), Jen informed me that she had already watched the movie earlier in the week on her own, and I was off the hook. 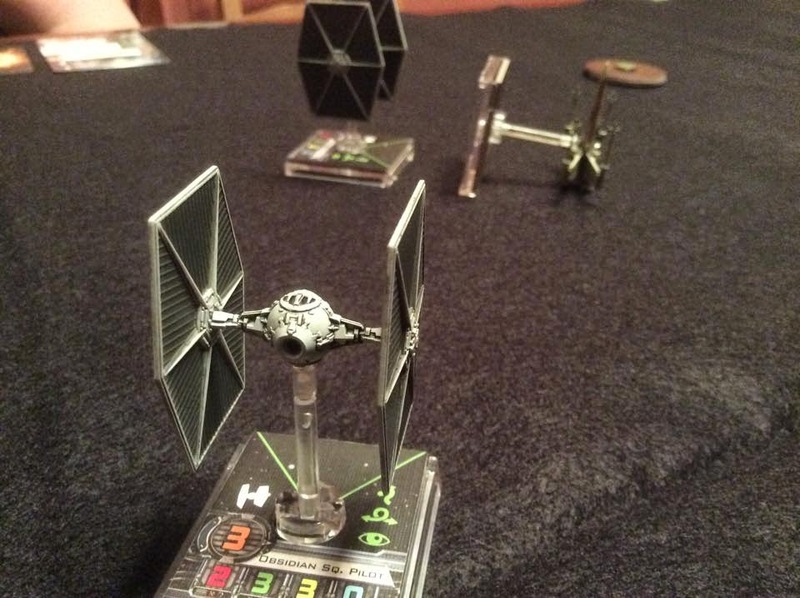 So long as I promised to give her a foot rub after our game, she had no problem sitting down for the maiden flight of my Imperial TIE Fighters! 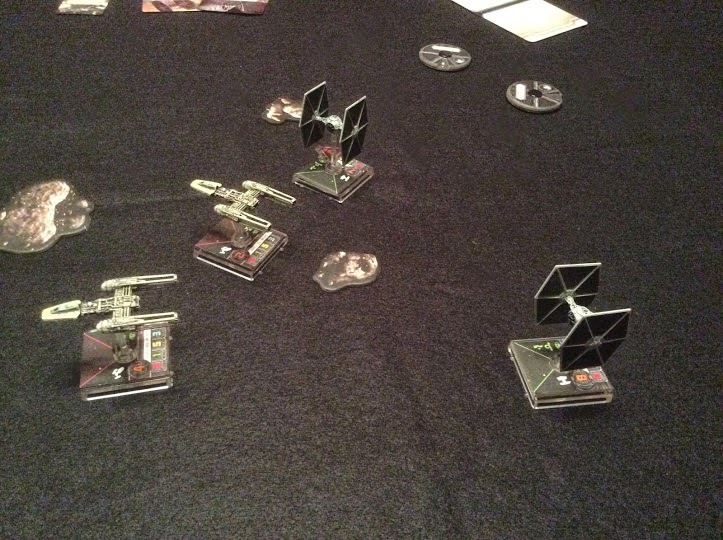 Lone X-Wing vs. 2 TIE Fighters as we try the "Quick Start Rules" provided in the Star Wars X-Wing Miniatures starter set. Please note that these rules are trimmed down and exclude a lot of the rules so that players can learn the basics of the game. Before I get into the details of this first game, I need to thank my wife again for being so awesome. 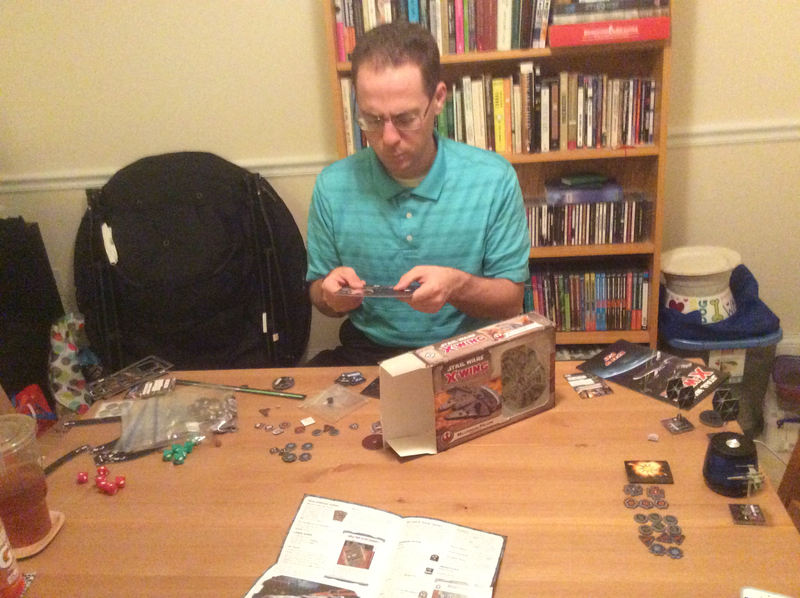 The last time Jen played a miniatures combat game was back in 1999, when she tried Crimson Skies. She may have played one other time in '99, but no more. She admitted, before we played, that she would probably not do very well, and asked that I don't embarrass her. Unfortunately, the Emperor demanded blood! 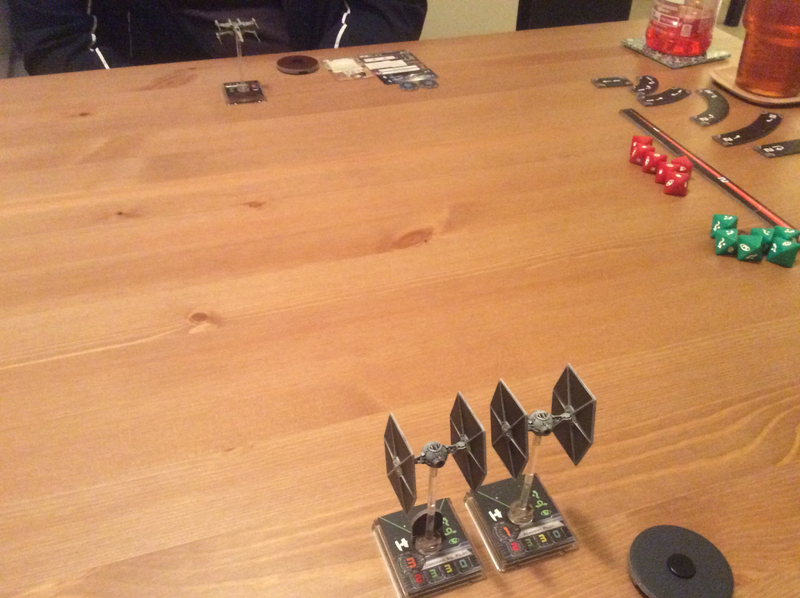 My two TIE Fighters darted ahead as Jen's X-Wing banked right. I then started chasing her, lining up at least one of my pilots for a shot each round. 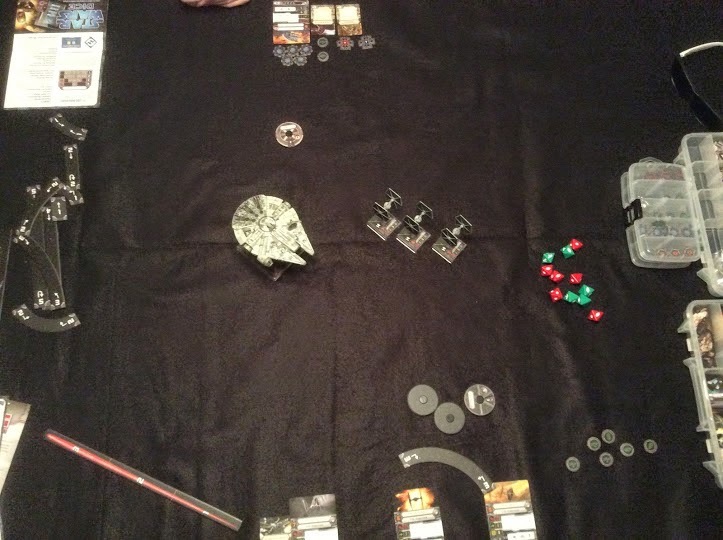 Each time I had a shot, Jen's X-Wing pilot was just out of reach, save for a single round. 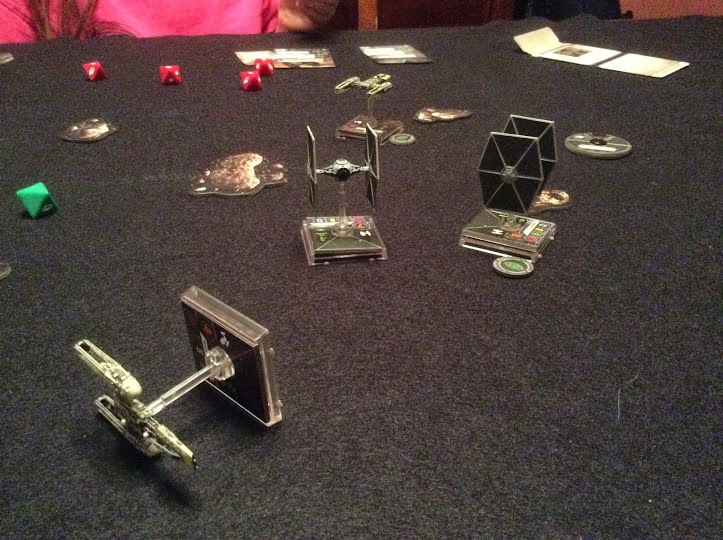 Eventually Jen's X-Wing pilot broke free, but I was right on her tail, continuing to fire. Actually her rolling was quite good! She kept evading my attacks, and I couldn't seem to land a shot, despite being right on her tail. Unfortunately for Jen, only a couple rounds later I was again lined up so that both of my TIE's could shoot. Jen's X-Wing was heavily damaged, and probably should've made the jump to lightspeed in retreat, but perhaps her hyperdrive was damaged. Academy Pilot proudly got his first kill! 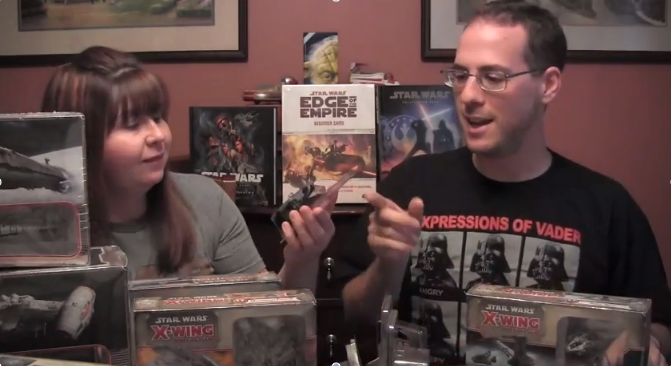 Over the next few weeks we plan on learning all of the ins and outs of the Star Wars X-Wing Miniatures Game (as well as the Star Wars Edge of the Empire Role-Playing Game), and would love to hear some feedback! As we get closer to Star Wars Day (May the Fourth), we will be doing some actual play videos, reviews, and perhaps a few more Flight Reports as I face off against other pilots! … we now have quite a few to choose from!